Product info: Width: 3 m. Length: 3 m. Side height: 3.1 m. Ridge height: 3.4 m. Roof cover: 300g/m2 300Dx300D polyester with PVC backing Sidewalls: 300g/m2 300Dx300D polyester with PVC backing Frame: Aluminium Tubes / fittings: 50 x 50 x 1.8 mm + 45 x 45 x 1.8 mm + 35 x 18 x 1. Carcoon 4x1.6 m. Clear. Indoor. Width: 4 m. Length: 1.6 m. Weight: 10 kg. Indoor Carcoon For storage of cars and MCs Active Airflow ventilation system Smart Battery Control Very easy in use Special tarpaulin zipper to a quick and easy access Height: 160 cm The price does not include freight. Please contact our customer service. Frame: Powder coated steel tubing for protection against corrosion Width: 0.48 m. Length: 0.43 m. Side height: 0.89 m. Folds completely flat for easy storage Powder coated steel tubes Tube thickness: 1, 0 mm Seat thickness: 2-3 mm Back thickness: 2-3 mm Dimensions (folded): 48 x 20 x 99 cm (W x D x H) The price does not include freight. Product info: Width: 3.03 m. Length: 2.37 m. Side height: 1.6 m. Ridge height: 2.02 m. Roof cover: Hot dipped galvanized steel Sidewalls: Hot dipped galvanized steel The price does not include freight. Please contact our customer service. Dancover Ireland Our professional sales advisors are at your service. Roof cover: Strong PVC 500 gr/m², Flame retardant, 100% Waterproof Sidewalls: Strong PVC 500 gr./m², Flame retardant, 100% Waterproof Frame: Hot-dip galvanized Tube diameter: 48mm Width: 8 m. Length: 9 m. Side height: 3 m. Ridge height: 5 m. Included: Strong stake pegs One of our most popular storage shelters Engineered and designed for storage of machines and materials Tube diameter: 3, 5 mm thickness (bearing construction) The shelter is secured with stake pegs Easy to assemble Mechanical gate cover with strong Velcro closings Gate size: 3. Carcoon 4.7x2 m. Outdoor. Silver. Width: 4.7 m. Length: 2 m. Weight: 20 kg. 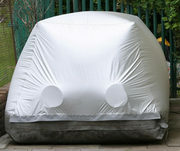 Outdoor Carcoon Double skin construction UV resistant tarpaulin Waterproof For storage of cars and MCs Active Airflow ventilation system Smart Battery Control Very easy in use Special tarpaulin zipper to a quick and easy access Height: 150 cm Delivery: 5 - 7 weeks The price does not include freight. Frame: Powder coated steel tubing for protection against corrosion Tubes / fittings: 28mm Width: 76 m. Length: 183 m. Weight: 12.4 kg. Folds for easy storage Powder coated steel tubes Table top made of High-Density Polythylene Dimensions (open): 183 x 76 x 74 cm (L x W x H) The price does not include freight. Product info: Width: 3, 00 m. Length: 3, 00 m. Side height: 1, 80-2, 10 m. Ridge height: 3, 10-3, 46 m. Roof cover: 300g/m² 300Dx300D polyester with PVC backing Frame: Aluminium Tubes / fittings: 40x40x1.1mm + 25x25x1.1mm + 26x13x1.1mm Colour: White Water resistance: 100% Waterproof Weight: 31 kg. Material: 100% Recycled PE Width: 0.5 m. Length: 0.5 m. Side height: 0.05 m. 100% recycled Pe and 100% recyclable UV-resistant Max load 90 t/m² Stands almost any amount of cold or heat Does not need maintenance Approach ramps are optional extras The price does not include freight. Please contact our customer service. Product info: Width: 2.4 m. Length: 3.6 m. Side height: 1.93 m. Ridge height: 2.37 m. Roof cover: Strong PVC 500 gr/m² Sidewalls: Strong PVC 500 gr./m² Frame: Galvanized steel tubes Tubes / fittings: 32x1, 2mm + 25x1, 1mm The price does not include freight. Please contact our customer service. Roof cover: Strong polyethylene tarpaulin 300 gr./m², Flame retardant, 100% Waterproof Sidewalls: Strong polyethylene tarpaulin 300 gr./m², Flame retardant, 100% Waterproof Frame: Powder coated steel tubing for protection against corrosion Tube diameter: 60/2 mm Width: 4 m. Length: 10 m. Side height: 3. Product info: Width: 3 m. Length: 6 m. Side height: 2 m. Ridge height: 2.95 m. Roof cover: Strong polyethylene tarpaulin 200 gr./m² Sidewalls: Strong polyethylene tarpaulin 200 gr./m² Frame: Galvanized steel tubes Tubes / fittings: 38x1.0 mm The price does not include freight. Product info: Width: 4 m. Length: 4 m. Side height: 1.97 m. Ridge height: 3.4 m. Roof cover: 220g/m² Polyester with PVC backing Sidewalls: 160g/m² Polyester with PA backing Frame: Powder coated steel tubing for protection against corrosion Tubes / fittings: 34mm The price does not include freight. Product info: Width: 5 m. Length: 6 m. Side height: 2 m. Ridge height: 2.85 m. Material: Strong polyethylene tarpaulin 200 gr./m² Roof cover: Strong polyethylene tarpaulin 200 gr./m² Sidewalls: Strong polyethylene tarpaulin 200 gr./m² Frame: Galvanized steel tubes Tubes / fittings: 38x1. Roof cover: Strong PVC 500 gr/m², Flame retardant, 100% Waterproof Sidewalls: Strong PVC 500 gr./m², Flame retardant, 100% Waterproof Frame: Hot-dip galvanized Tube diameter: 48mm Width: 4 m. Length: 12 m. Side height: 4.5 m. Ridge height: 5.5 m. Included: Strong stake pegs Measurements: Width x Length x Side height x Height (ridge) Engineered and designed for ultimate boat storage 100 % waterproof cover Tube diameter: 48 mm - 3, 5 mm thickness (bearing construction) Warm galvanized, rust-preventing surface treatment The shelter is secured with stake pegs Easy to set up Gate cover with 3 strong, double Velcro closings Gate size: 5. Roof cover: Strong PVC 600 gr./m², Flame retardant, 100% Waterproof Sidewalls: Strong PVC 600 gr./m², Flame retardant, 100% Waterproof Frame: Hot-dip galvanized Tubes / fittings: 48/3, 3 mm Width: 4 m. Length: 14 m. Side height: 3.5 m. Ridge height: 4.5 m. Included: Strong stake pegs Measurements: Width x Length x Side height x Height (ridge) Engineered and designed for ultimate boat storage Tube diameter: 48 mm - 3. Roof cover: Strong polyethylene tarpaulin 300 gr./m², Flame retardant, 100% Waterproof Sidewalls: Strong polyethylene tarpaulin 300 gr./m², Flame retardant, 100% Waterproof Frame: Galvanized steel tubes Tube diameter: 42/22mm Width: 3.6 m. Length: 7.2 m. Side height: 2.13 m. Ridge height: 2.7. Roof cover: Strong polyethylene tarpaulin 300 gr./m², Flame retardant, 100% Waterproof Sidewalls: Strong polyethylene tarpaulin 300 gr./m², Flame retardant, 100% Waterproof Frame: Galvanized steel tubes Tube diameter: 42/22mm Width: 3.6 m. Length: 8.4 m. Side height: 2.13 m. Ridge height: 2.7. Roof cover: Strong polyethylene tarpaulin 300 gr./m², Flame retardant, 100% Waterproof Sidewalls: Strong polyethylene tarpaulin 300 gr./m², Flame retardant, 100% Waterproof Frame: Galvanized steel tubes Tube diameter: 32mm Width: 3.3 m. Length: 6 m. Side height: 1.96 m. Ridge height: 2.4 m. Included: Stake pegs Weight: 99. Roof cover: Strong polyethylene tarpaulin 200 gr./m², , 100% Waterproof Frame: Galvanized steel tubes Tube diameter: 38mm Width: 5 m. Length: 8 m. Side height: 2 m. Ridge height: 2.75 m. Weight: 1 kg. Online orders only! Our best-selling Party Tent Marquee 5 x 8 m 2 side walls with 8 m. long sections with large Georgian style windows Entrance door in both end walls Easy assembly in approximately 1 hour The price does not include freight. Roof cover: Strong PVC 500 gr/m², Flame retardant, 100% Waterproof Sidewalls: Strong PVC 380 gr./m², Flame retardant, 100% Waterproof Frame: Galvanized steel tubes Tube diameter: 42/38mm Persons: 50 - 67 Width: 5 m. Length: 10 m. Side height: 2 m. Ridge height: 2.75 m. Weight: 161.55 kg. Strong alternative to our Polyethylene Party Tent Marquees Large Georgian style windows in the side walls Entrance door in both end walls Easy assembly with bungees in approximately 1 hour The price does not include freight. Roof cover: Strong PVC 500 gr/m², BS 5438:1989 2B Certificate, 100% Waterproof Sidewalls: Strong PVC 500 gr./m², BS 5438:1989 2B Certificate, 100% Waterproof Frame: Galvanized steel tubes Tube diameter: 54x1, 5mm, 50x1, 5mm, 38x1, 1mm Width: 7 m. Length: 7 m. Side height: 2.3 m. Ridge height: 3. Width: 3 m. Length: 4 m. Side height: 1.6 m. Weight: 18 kg. Outdoor Carcoon Double skin construction UV resistant tarpaulin Waterproof For storage of cars and MCs Active Airflow ventilation system Smart Battery Control Very easy in use Special tarpaulin zipper to a quick and easy access Height: 150 cm Delivery: 5 - 7 weeks The price does not include freight. Width: 2.3 m. Length: 4.33 m. Weight: 2 kg. Indoor Carcoon with a Drive in option For storage of cars and MCs Active Airflow ventilation system Smart Battery Control Very easy in use Special tarpaulin zipper to a quick and easy access Height: 160 cm The price does not include freight. Please contact our customer service. Material: 100% Recycled PE Width: 0.05 m. Length: 0.15 m. Side height: 0.05 m. Weight: 1 kg. Width: 15 cm Weight: 135 g UV-resistant Max load 90 t/m² Stands almost any amount of cold or heat Does not need maintenance The price does not include freight. Please contact our customer service. Material: PE250g Width: 6 m. Length: 8 m. Weight: 20 kg. High quality PE cover solution Good quality Ripstop Eyelets Description Low priced tarpaulin made of Polyethylene (PE) with built-in ripstop. The tarpaulin is delivered with eyelets in the edging. The tarp is easy to handle due to the low weight, and it has a variety of applications. Frame: Fiber glass in strong quality Width: 1.4 m. Length: 2.05 m. Ridge height: 1 m. Weight: 1.85 kg. A roomy camping tent for up to 2 people Easy to set up and take down and store Marked poles to facilitate the setup Tapedseams Water column pressure: 1500 mm Ventilation at the top Mosquito nets in the door D-ring to the lantern Luminous nylon lines Storage bag for tent, pegs and lines The price does not include freight. A. A-leg max length: 3, 8 m B. Stay length: 1, 5 m C. Deck legs 0, 9-1, 7 m: 4 pcs A-legs stand directly on the ground, which helps minimize wind pressure against the boat Deck-legs help ensure outstanding stability A-legs and Deck-legs are telescopic Description 9 m A-frame for boat cover. Dublin ads Dublin, All categories classifieds Dublin, All categories free ads Dublin, ads for sale Dublin, ads to buy Dublin, FREEADS in Ireland Dublin Page number 9-1. Find here ads for sale, to buy and rent in Dublin. Goods for sale in Dublin, vehicles for sale in Dublin, Dublin real estate for sale, Dublin property for sale, property for rent in Dublin, business ads in Dublin, Dublin business classifieds, services in Dublin, Dublin services ads, jobs in Dublin, pets for sale in Dublin, Dublin dating, Dublin cars for sale.